I had an appointment this morning that was close enough to home that I could walk, and on the way home, I passed the most gloriously named bakery, Glory Hole Doughnuts. Yes, that is the actual name of an actual doughnut shop in my neighbourhood. Their tagline is, “What creams are made of”. Of course, I simply *had* to go in and check it out. For such a tiny shop, there were so many awesome doughnut creations to choose from! 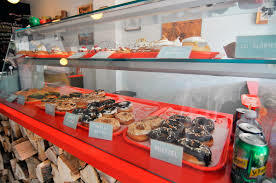 They all had yummy sounding names such as S’more, Chai Brulee, Lemon Cheesecake, Cinnamon Toast Crunch, Almond Cream, Toast and Butter, Eggnog, London Fog, Ricotta Lemon, and Olive Oil, and a bunch of others in both yeast doughnut and cake doughnut forms. I honestly wanted to try one of everything…but upon hearing that a dozen of these little beauties was going to be $30, I rethought my strategy of putting my husband and myself into diabetic comas, and instead settled for three of the most interesting ones. 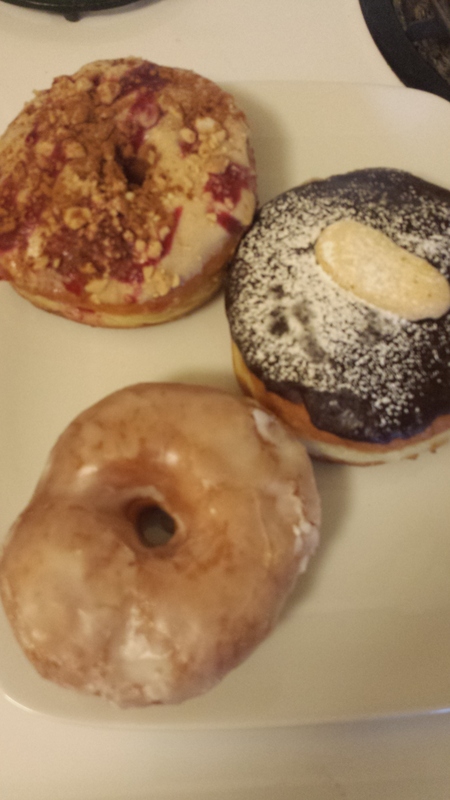 I ended up choosing a PB&J doughnut (top left), a Tiramisu doughnut (top right), and a simple-looking Dark and Stormy doughnut (bottom left). The PB & J was super-sweet, with lots of peanuts festooned across the top. As you can see, it wasn’t as prettily decorated as the ones I saw later online on their website, but it did the trick. 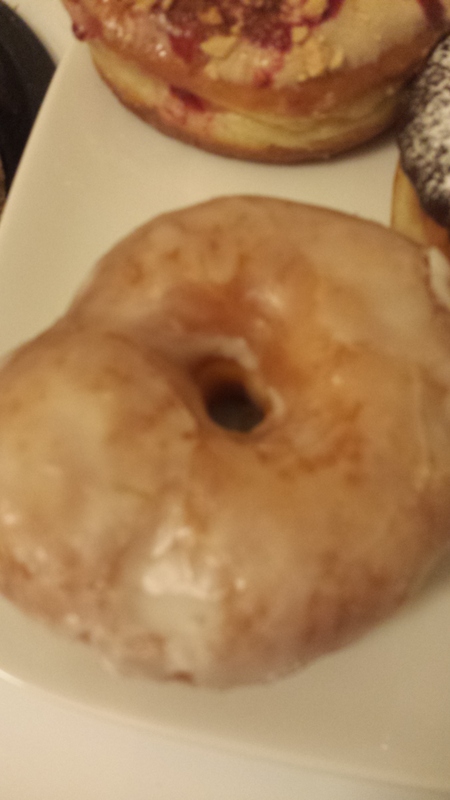 And of course the yeasty doughnut itself was super soft and squidgy and very yummy. If you like both peanut butter and jelly and things that are intensely sweet, as in teeth-hurtingly-sweet, then this is the doughnut for you. 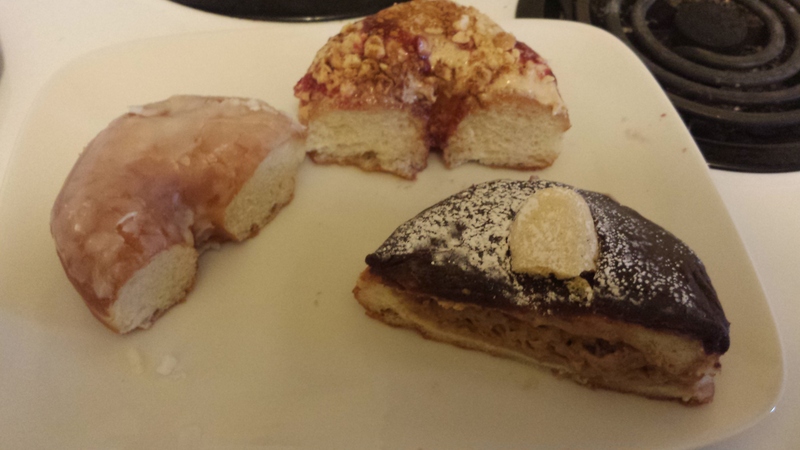 The Tiramisu doughnut was a new one for me; like a Boston Cream doughnut, it was filled to bursting with pastry cream. However, this pastry cream was heavily flavoured with coffee and cinnamon and I think a touch of chocolate, just like Tiramisu. The chocolate topping was not a standard chocolate fondant, but a slightly grainy, intensely chocolatey layer, with a cute and crunchy little ladyfinger on top. I ended up having to take most of the filling out of this doughnut before I could finish it, but then, I’ve never been a big fan of filled doughnuts. 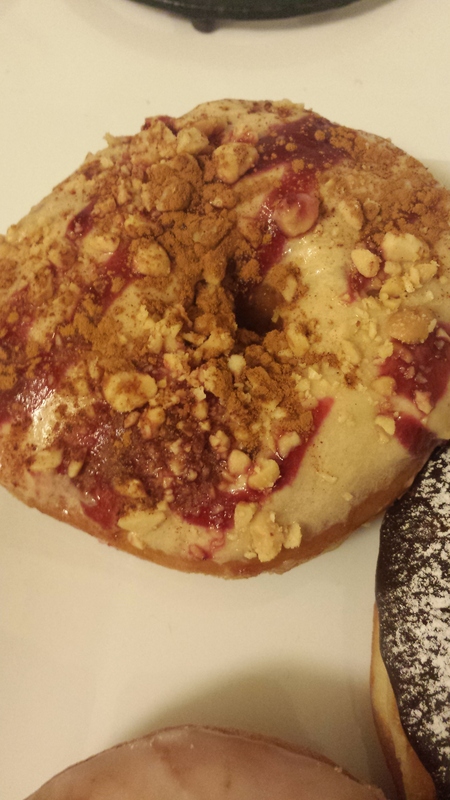 If you’re a big fan of both cream-filled doughnuts and Tiramisu, I’d strongly recommend this doughnut! 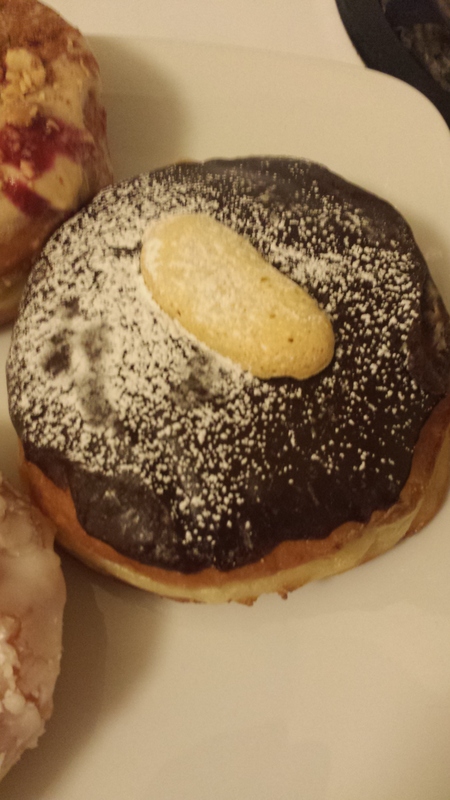 Lastly, but certainly not least, is the incredibly unassuming-looking Dark and Stormy doughnut. A simple yeast doughnut with a delicious lime, ginger, and rum glaze, this was most definitely my favourite!If I had the recipe for this glaze, I would put it on pretty much everything; cereal, milk, pot roast, vinyl flooring, you name it. I’m glad I was finally right-place-right-time to really try one of my ‘hood’s local specialties which I always hear about after the fact. It’s my hope that for the remaining time we are here in Parkdale, I’ll have the opportunity to try some more local treats and write about them, if only to capture a moment in time when this neighbourhood was not quite trendy or cool, but on the cusp of greatness. Back to posting about awesome recipes soon! Next Post Geekery: Gimme ALL THE SUPERHEROES!